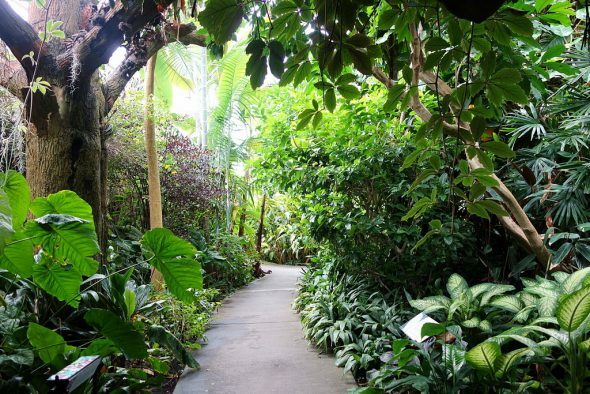 Botanical gardens offer people a refreshing escape from the hustle and bustle of New York City. A botanical garden is a world of horticultural wonder, a captivating yet serene environment teeming with blossoming vegetation where one experiences and appreciates the delights and benefits of nature. 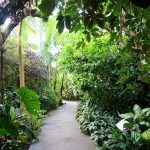 Here is a guide to the best five botanical gardens for tourists and residents in the boroughs of New York City. Located at 990 Washington Avenue in the borough of Brooklyn, BBG (as this arboretum is known) has numerous gardens and plant collections. BBG’s most celebrated attraction is the Japanese Hill-and-Pond Garden. Opened to the public in 1915, the Japanese Hill-and-Pond Garden was the first Japanese-inspired garden created in an American public space. The designer, Takeo Shiota, was recommended by the Japanese Consul General. This particular garden is an attractive combination of the ancient hill and pond style and the more modern stroll-garden style. BBG also has an impressive indoor plant collection in the Steinhardt Conservatory complex, which consists of several connected pavilions. Particularly impressive is a tropical pavilion. Occupying 6,000 square feet under glass, this structure simulates a tropical rainforest, complete with plants and trees native to the African rainforest, the Amazon jungle, and tropical eastern Asia. The BBG has many more horticultural life forms from deep-blue Spanish bluebells to cherry trees. The New York Botanical Garden, or NYBG at 2900 Southern Boulevard in the Bronx is the largest botanical garden in the United States. And what attractions NYBG has! There’s the Native Plant Garden, home to nearly 100,000 plants native to northeastern North America. Visitors can study the animals that are attracted to the plants- chipmunks, frogs, and assorted birds. At the center of this garden is a beautiful and tranquil pool. The Jane Watson Irwin Perennial Garden is a gorgeous composition of florae and foliage. It contains four themed rooms, each one containing a gathering of plants chosen for their color or seasonality. The exhibits in each of these rooms are constantly rotating. Visitors can also savor the Marjorie G. Rosen Seasonal Walk, a stroll through a garden of floral delights as they develop throughout the four seasons. This arcadia is located at 43-50 Main Street in Flushing, Queens. Visitors to this 39 acre attraction will be enchanted by a variety of gardens. The Bee Garden is inhabited by Italian Honeybees drawn to its plants and trees. The Herb Garden houses a variety of specimens grouped by function: aromatic, culinary, medicinal, and plants used in manufacturing dye. The Wetland and Woodland Garden showcases marshes, swamps, woodlands, and bogs which sustain birds and other wildlife. The youngsters can enjoy the Children’s Garden, where they can learn how to create their own gardens. The Queens Botanical Garden also has an art gallery of crafts depicting plant life. This attraction is at the Snug Harbor Cultural Center at 1000 Richmond Terrace in Staten Island. Not only can visitors delight in studying diverse gardens, they can marvel at other interesting features. Particularly fascinating is the Connie Gretz Secret Garden, modeled after Frances Hodgson Bennett’s classic children’s book The Secret Garden. The plaque on this garden’s inside wall reads: “The hedge maze, which conceals this secret garden, is meant to teach children and remind grownups that although life’s path is never straight, we should look for the magic and joy in each step of the journey. For it is only through life’s journey that we each find the peace and beauty of our own secret garden.” Another intriguing exhibit is the New York Chinese Scholar’s Garden. It consists of a compilation of various Chinese gardens and was modeled by Chinese craftsmen on the Ming Dynasty Gardens (1368-1644). The Chinese Scholar’s Garden has impressive rockery that resembles the Chinese mountains that inspired the poetry and art of native scholars. Among its other features, there is a bamboo forest path and a Koi-filled pond. This botanical wonder is a 28-acre estate at 675 West 252nd Street in the Bronx. When Wave Hill House was built in 1843, it functioned as a private estate. It remained so for over a century until 1960 when its last owners, the Perkins family, donated the property to New York City. Wave Hill was established as a not-for-profit entity in 1965, and remains so today. Nevertheless, the grounds still have the pleasing atmosphere of a private estate, particularly with its grand nineteenth-century house and its vast lawn. Its 28 acres of spectacular gardens, including a conservatory greenhouse, astonish with their beauty. A stylish pergola covered with two varieties of kiwi vines provides a breathtaking view of the Hudson River. Wave Hill offers a welcome respite from the hectic city life. New York City’s botanical gardens are a treat to the eyes and a stimulant to the mind. They are a glorious example of the power of the environment to uplift the soul. They give visitors a deepened respect for the bounties of the earth and a resolve to preserve its gifts for the generations to come. If you want to go ghost hunting this Halloween or any other time of the year, visiting a haunted lighthouse can be a good place to start. Lighthouses seem to have a mysteriousness about them whether they are haunted or not. However, those that have a paranormal history are even more interesting. 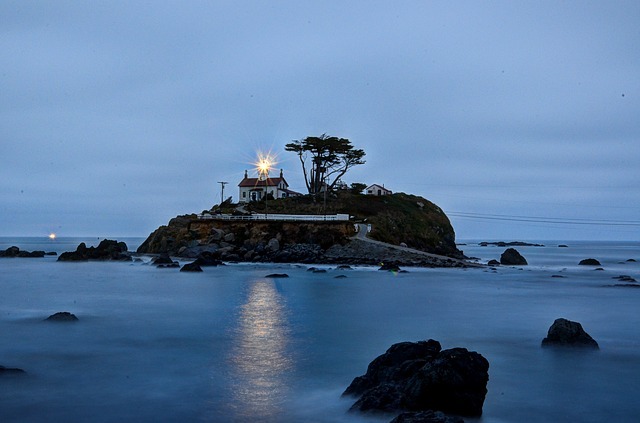 Let’s take a look at 10 of the most haunted lighthouses in the United States. Located in Scotland, Maryland, Point Lookout Lighthouse is considered the most haunted lighthouse in America. The lighthouse began operation in 1830. James Davis was the first keeper of the lighthouse until his death only a few months later. Ann Davis took over as keeper of the lighthouse after the death of her father. Ann passed away in 1847 and William Wood took over her lighthouse duties. Later, Richard Edwards became keeper but died the same year. Afterward, his daughters subsequently became keepers of the lighthouse. 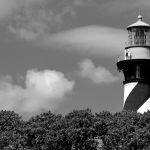 It is uncertain what spirits may be haunting Point Lookout Light, but people have reported hearing voices and footsteps. Lights turn on and off and doors open and shut. Apparitions have also been seen. If you’re interested in visiting, you can reserve a spot for their paranormal night tours. Big Bay Point Lighthouse is located in Big Bay, Michigan. It was constructed in 1896. William Prior was the first lighthouse keeper and it is his ghost that supposedly haunts it. Mr. Prior disappeared into the woods with a gun, presumably to commit suicide because he was distraught over the death of his son. However, his remains were found a year later hanging from a tree. People have reported seeing apparitions of Mr. Prior. Big Bay Point Lighthouse is now a bed and breakfast, so if you’d like to go for a visit you might get a peek of William Prior’s ghost as well as a view of Lake Superior. 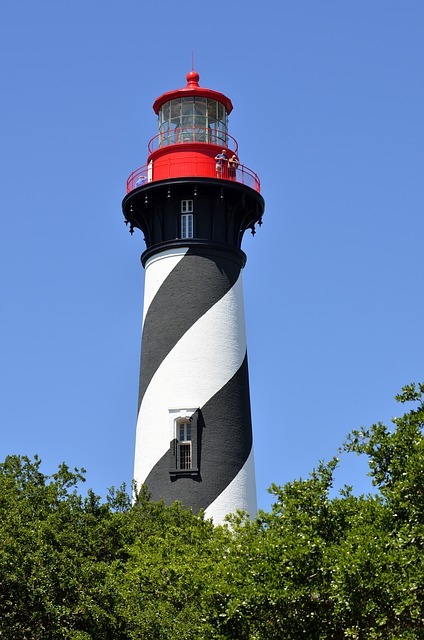 St. Augustine Lighthouse is located in St. Augustine, Florida. It was built in 1874 and has a winding staircase comprised of 219 steps. The property that the lighthouse sits on was originally owned by a man named Dr. Alan Ballard. Dr. Ballard was forced to sell it to the government; however, he claimed he would never leave the land. Some people claim his spirit never did. The lighthouse was built by Hezekiah Pettee. Tragedy struck when two of Hezekiah’s children died in an accident. 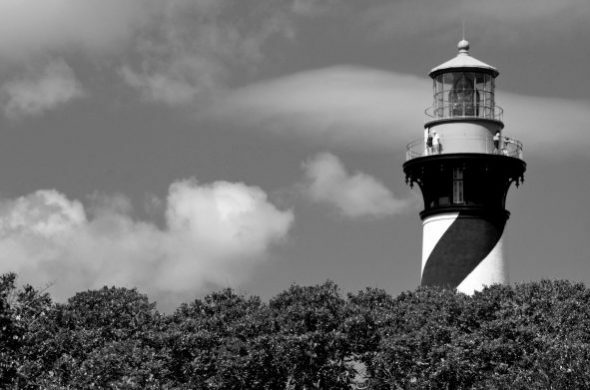 People have reported the apparition of a young girl at the lighthouse, which may be the spirit of one of Hezekiah Pettee’s daughters. The paranormal activity surrounding the place includes laughter, cold spots, and items moving from one place to another. St. Augustine Lighthouse is now a museum that offers paranormal tours. It has even been investigated by the team from the Ghost Hunters television show. 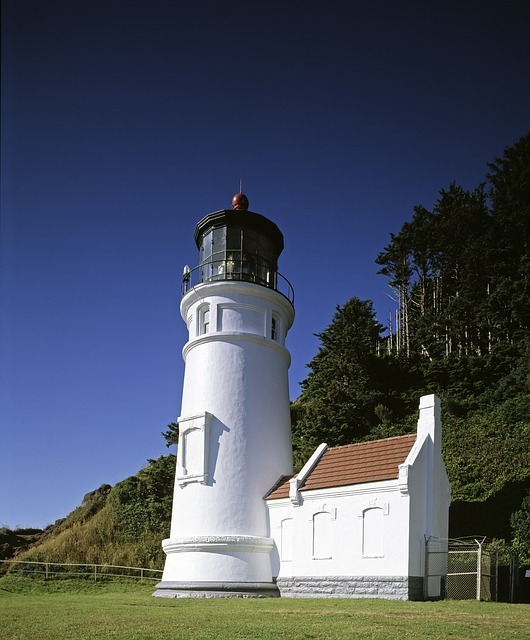 Battery Point Lighthouse is located in Crescent City, California. It is situated on Battery Point island but only sits on the island during high tide. It was built in 1856. The lighthouse has had its share of keepers throughout its history as well as paranormal activity. Battery Point lighthouse is even reported to have a playful resident ghost. Visitors to the lighthouse have reported sensing a presence and even being touched. Battery Point Lighthouse is still operational as a private navigational aid, although it has been decommissioned. It is also a museum that is open for tours. Heceta Head lighthouse is located in Yachats, Oregon. It has a 56-foot tall tower that sits 205 feet above sea level. Although there are many claims that the lighthouse is haunted by a woman, there is some confusion her identity. The lighthouse duplex housed two assistant keepers besides the actual lighthouse keeper, and the story goes that she was the wife of one of the assistants. One story says that her daughter drowned and the woman then took her own life. The other story described a domineering and tidy woman with no mention of a child. Caretakers and workers at the lighthouse have reported hearing screams, footsteps and feeling both cold and hot spots. They claim to have seen apparitions of the woman as well. Heceta Head Lighthouse is now a bed and breakfast, so if you’re ever in the neighborhood, there’s a good chance this ghostly woman will make an appearance. If you happen to live near one of these mysterious lighthouses, stop by and see if the claims of ghosts are true. If you’re not in the area but find places such as these intriguing, add a visit to one or two of them to your bucket list. Even if you don’t see any ghosts, at least you had a vacation or a weekend away. Take the whole family or a few friends and enjoy the adventure.